Porsche Classic will be present at the 2010 Goodwood Revival, a celebration of the golden era of motorsport which takes place at the Goodwood Motor Circuit, near Chichester, from September 17-19. Porsche Classic, the department of Porsche AG responsible for supporting all Porsche classic cars, will be recreating the spirit of the early 1960s at the March Motorworks and showcasing the expertise of the specialists of the Porsche Classic workshop as well as the comprehensive range of Porsche Classic original parts and technical literature. The famous “Grandmother”, the 718 W-RS Spyder, from the Porsche Museum will be worked on during the event by two mechanics in a lovingly recreated, classic workshop. Two workbenches will also give visitors the opportunity to see work in progress on engines from the 356 and 912, and a 356 transmission. Original old drawings, lubrication plans, racing posters and trophies will be on display; and fans of the Porsche 356 can examine many original parts which are still available from Porsche Genuine Parts, including the front grille, brake drums, wings or headlight lenses at a historic After Sales counter. The Classic experts from Stuttgart in Germany will be present at the Porsche exhibit to offer advice and information on all questions relating to the supply of Porsche original spare parts and the restoration of classic Porsche vehicles. The Goodwood Revival, which has been taking place at the Goodwood Motor Circuit since 1998, is a very special experience. The most popular meeting of Pre-1966 racing cars in the world, it gives visitors a taste of the ‘40s, ‘50s and ‘60s. The vintage and classic races on the authentic circuit, which remains untouched by modern motor sports, are not the only spectacular feature: visitors also dress up in period clothing to immerse themselves in another world and bring the old times to life. In 2009, over 136,000 visitors marvelled at around 530 classic racing cars from all over Europe, which competed in 16 classes. Legendary race drivers such as Sir Stirling Moss, John Surtess and Porsche legends Richard Attwood and Derek Bell all regularly participate in this three day event. 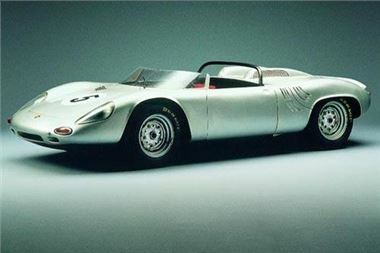 The first two-litre, eight-cylinder Porsche is affectionately nicknamed ‘Grandmother’ by the mechanics because of its exceptionally long motorsport career (1961 – 1964). Its history of wins includes sensational class victories, such as those at the Targa Florio in 1962 and the 1,000 kilometre race at the Nürburgring. The ‘Grandmother’ dominated the European Hill Climb Championship in 1963 and 1964, and twice drove Edgar Barth to the Championship title. The car belongs to the Porsche Museum and has been restored by Porsche Classic.